There’s a saying in business: “Fast, cheap, right—you can pick any two that you want.” It’s very difficult to get away from this reality, even when it comes to cellular distributed antenna systems (DAS). In the passive DAS industry, there are many product suppliers who sell systems, but very few experts and integrators who can help you choose the right solution and make that solution work in your building. In today’s “click to buy” world of ecommerce, it’s tempting to purchase a cell signal booster system from an online retailer who offers a great price and fast shipping. A WilsonPro signal booster kit is going to have the same high-quality components, no matter who you buy it from. But did you buy the right number of amplifiers and antennas? Does your office or commercial building have any important considerations, like building codes that require fire-rated cable in plenum spaces? Do you have penetration spots to feed a cable to the roof for the outside donor antenna? And is the cellular reception outside your building even strong enough for your WilsonPro system to collect enough signal to amplify? “Click to buy” retailers may be fast and cheap, but they often don’t have the knowledge and experience to help you choose the right WilsonPro cellular DAS system for your building’s unique considerations and requirements. Perhaps you bought the right WilsonPro system for your building, and at a terrific price. Can someone install it properly in your building so it provides the best possible improved signal coverage? A “do-it-yourself” approach is likely going to mean a lot of trial and error: Set it up and turn it on. Test your reception. Move the inside broadcast antennas to different spots. Test again. One antenna seems to be interfering with a WiFi antenna, so move that. Test again. Move, test, move, test, wash, rinse, repeat. Eventually you might get an acceptable balance of coverage, maybe with weak reception in the break room, or a dead zone in the CEO’s corner office—assuming your patience hasn’t worn thin by this time, to the point where you’re ready to pack up the entire system and send it back. 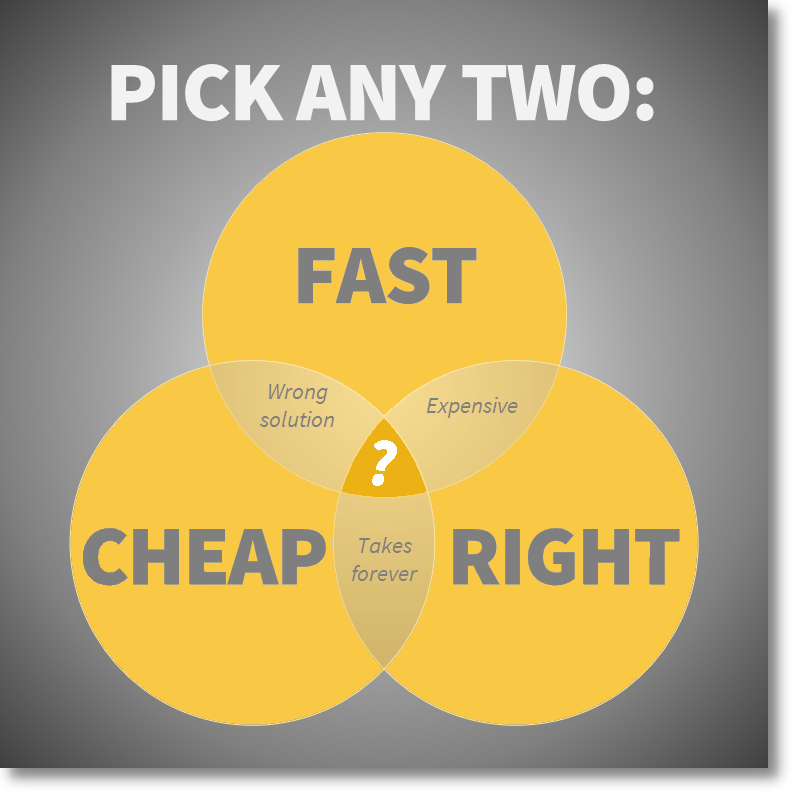 Cheap and right doesn’t guarantee that what you bought is going to be up and running in an acceptable timeframe. This is the realm of fiber DAS systems...well, sort of: a properly designed fiber DAS system can take months to plan and install, and sometimes longer. One thing is certain, though: fiber DAS isn’t cheap. At $3 to $5 per square foot of signal coverage, plus the cost of the base station, the price for one a fiber DAS system can easily run into the seven figures for a large building. In contrast, a professionally designed and installed WilsonPro system, with the same amount of in-building coverage, goes for a fraction of that amount. 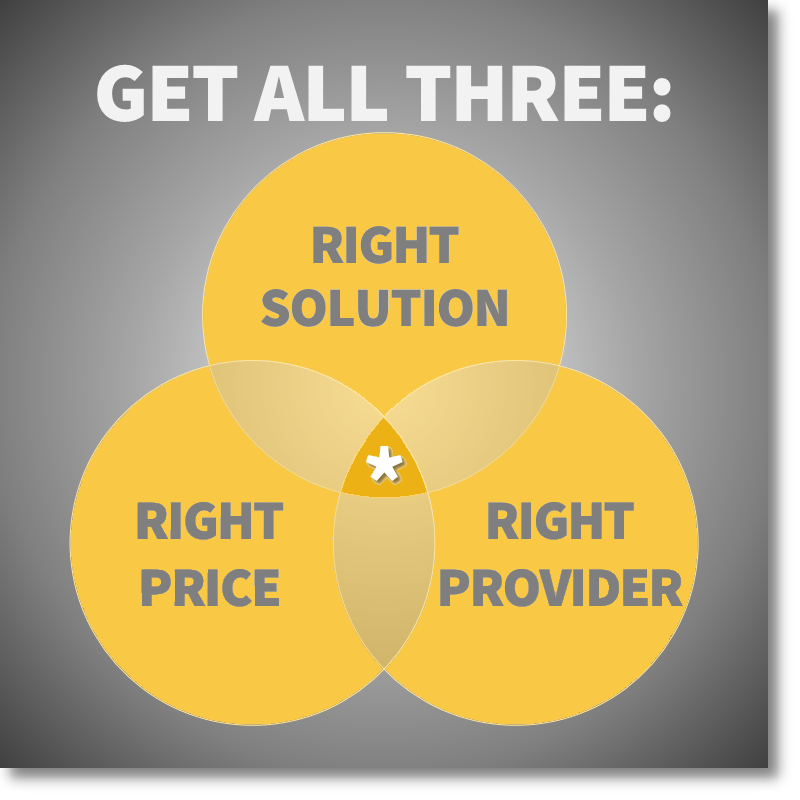 Fast, cheap, right: Is it possible to have all three? Does improving the cell signal in your large building mean that you have to compromise on price, or install time, or expertise? No! You can have a WilsonPro passive DAS system, designed by professionals and installed by experts, on your timetable and in your budget. Passive cellular DAS is different than installing cable or satellite television or setting up a WiFi network; it requires specific knowledge, skill, and experience. If you want the right solution, the right price, and the right provider, make sure you choose your WilsonPro vendor based on their expertise, qualifications, and the number and types of buildings in which they’ve installed WilsonPro systems. buildings in some of the most remote locations in America. Please visit Powerful Signal at WilsonProWay.com or PowerfulSignal.com to learn more about we can fix your poor cell signal—fast, right, and at a price that will fit your budget.